What Do You Know? 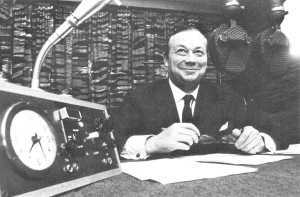 was a quiz show created by John P. Wynn on the Light programme and began in 1953 . Chaired by Franklin Engelmann, the contestants competed for the title 'Brain of Britain'. There was a memory test called 'Hear Hear' in the middle. (The programme was renamed 'Brain of Britain' in 1967 and is still going strong.) It transferred to TV as 'Ask Me Another' in June 1958. From our own Correspondent began in 1955 on the Home Service. A weekly forum in which foreign correspondents tried to convey something of life in distant lands. Five to Ten : A story, A hymn, and a prayer. The music used to introduce the programme was the third movement (Aria) from Handel's Concerto Grosso Op 6 No 12. Twenty Questions : Simply subtitled 'a radio parlour game' this quiz series based on the ancient pastime called 'Animal, Vegetable or Mineral' (to which was added 'Abstract') shot to the heights of popularity after its first broadacst in March 1947. It was originally chaired by Stewart MacPherson, and later by Gilbert Harding and eventually by Kenneth Horne. The idea was that a panel was invited to identify objects by asking only twenty questions. Regular panellists in the '50s included Richard Dimbleby, Anona Winn, Joy Adamson, Daphne Padel and Jack Train. Norman Hackforth was, for many years, the 'Mystery Voice' who informed the audience of the next object to be guessed, in a whisper close to the microphone, so that the panel could not hear. Mike Meehan produced the programme. The final edition was broadcast in 1976. Holiday Hour was broadcast on Sunday afternoons on the Light Programme and featured information about summer holidays on the Continent by Air, Coach and Rail using chartered trains, with a Tour Manager to make sure that everything ran smoothly. It was introduced by Franklin Engelmann with Bill Cormack, Thomas Cook's Publicity Manager, providing the travel facts and figures. Today with Jack de Manio (right) who presented the news and current affairs programme every morning from 1958 to 1971. Jack became a familiar radio character and was famed for his unfailing capacity for misreading the studio clocks. The Today programme has now reached its 50th. birthday. Movie-Go-Round : Introduced by Peter Haigh (left) and featured clips and music from the Movies. It's signature tune was 'The Carousel Waltz' from the contemporary film. Based at BBC Maida Vale studios, it broadcast clips from about 400 films in its first four years. Peter Noble contributed 'Around the British studios': in those days there were enough to keep him occupied! A Life of Bliss : beginning in 1953 and following on from 'Ignorance is Bliss', it starred George Cole playing David Bliss who was an awkward, bumbling young man with a tendency to find himself in awkward situations. The series also featured the voice of animal impersonator, Percy Edwards as 'Psyche' the dog. A version was later produced for television. See Snippets page for more information. A Case for Dr. Morelle : 'The man you love to hate! ', psychoanalyst-detective and male chauvinist pig, whose detection powers were dazzling, but whose treatment of females, especially his fluttery secretary Miss Frayle, verged on the abominable. 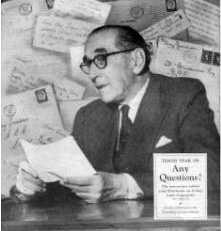 Written by author Ernest Dudley, Morelle was overbearing, sarcastic, patronising, contemptuous, cruel and unusually vindictive, Morelle was nevertheless doted upon by millions of listeners to his adventures on the radio in the 1940s and 1950s. 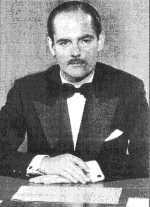 The first radio Morelle was played by the acerbic and distinctly toffish Dennis Arundell - a Fellow of St John's College, Cambridge, who later starred in many West End productions. A second series featured the even darker tones of Heron Carvic, later to write best-selling mysteries of his own, featuring the interfering spinster-sleuth Miss Seaton. In the 1950s, the part was played to pompous, thin-lipped perfection by Cecil Parker. The first Miss Frayle was played by author Dudley's wife, Jane Grahame, while a later incarnation was Sheila Sim. Through the 1950s Ernest Dudley wrote for both radio and television. His most popular TV series was 'Judge For Yourself', one of the earliest viewer-participation shows, in which, after a half-hour "trial", viewers were invited by Dudley to send in their verdicts, "Guilty" or "Not guilty". His catch-phrase, spoken to camera at the end, was always "Remember - you are the judge". Any Questions? Live topical, Friday-night discussion programme presented by Freddie Grisewood from Bristol (for over twenty years until his retirement at the age of seventy-nine!). Panellists on the first edition were Jack Longland, then chief education officer for Derbyshire; novelist Naomi Royde-Smith, who lived in Bristol; Honor Croome of The Economist; and John Arlott, then a talks producer with the BBC. Any Answers? began in 1954 to give listeners the chance to respond to comments made in the previous week's programme. Albert Saveen : First ventriloquist to have his own radio series, with a Light Programme show called Midday with Daisy May. A Cockney printer, Saveen developed the Daisy May voice by learning to use one lung at a time whilst recovering in hospital after being blown up by a bomb during the war. Round the Bend : Michael Bentine starred in the Home Service comedy show, some of it produced by Charles Chilton, which ran from 1957-60. Judith Chalmers, Ron Moody, Clive Dunn and Benny Lee also took part. The Barlowes of Beddington : (Jan 1955-Jan 1959) Warren Chetham-Strode, the distinguished playwright, wrote this situation series, 'The story of a public school seen through the eyes of a Headmaster and his Wife'. Patrick Barr played Robert Barlowe and Pauline Jameson, Kate, his wife. Evans, the Head Boy, was Edward Hardwicke, John Charlesworth was Finlay, Barry McGregor was Shepherd and boys in the background were pupils from Barking Abbey School. Geoffrey Wincott played Dogget, the School Porter and Anthony Shaw was the Governor, General Naseby. Under Milk Wood : The most celebrated piece of radio Britain has yet produced. Dylan Thomas's' ninety-minute 'play for voices' about the inhabitants of a small Welsh village called Llareggub. It was first broadcast on the Third Programme in January 1954 two months after its author's death. Actors in the first production included: Hugh Griffith (Captain Cat) Diana Maddox (Polly Garter), Philip Burton (The Rev. Eli Jenkins) and Rachel Roberts (Mrs. Dai Bread Two). The most stirring voice was that of Richard Burton. Paul Temple clip Paul Temple serialised the stories by Francis Durbridge. In the Temples' world of car bombs, poisoned cocktails, gentlemen and rogues, the villain was always caught. It starred Peter Coke from 1954 to 1968 (previously Kim Peacock, 1946-51) as Paul, and Marjorie Westbury as Steve. The original signature tune was taken from 'Scheherazade' by Rimsky-Korsakov, with incidental music taken from the works of other composers, including 'Tintagel' by Sir Arnold Bax. The signature tune was later changed to 'Coronation Scot' by Vivian Ellis. Riders of The Range : Cowboy Jeff Arnold and his faithful sidekick Luke were created in this musical drama series by the great Charles Chilton. It ran from 1949-53, each episode introduced by thundering hooves and ending with the bark of Rustler the Dog. The Piddingtons : Hightly publicised conjuring act who gave their name to a sensational series in 1949-50. Sidney Piddington and his wife, former actress Lesley Pope, appeared to read one another's minds, but were too subtle to claim that. 'Telepathy or not Telepathy? You are the judge' was how they concluded each show. Sydney and Lesley Piddington aroused great interest among the listening population during those post war years. Lesley would usually take a long time to receive Sydney's transmitted thoughts. While she was trying to read whatever it was Sydney was sending to her, she would repeatedly say "Concentrate a little more intently please". Sydney was usually sending her a name or the name of an object which she would receive and reveal eventually. These interludes of concentration captured the public's imagination and many listeners would claim to be receiving the transmitted thought waves whilst listening to the radio. Listeners would be discussing the programme the next day and some would claim they had received the thought waves and knew the name, or the name of the object, before Lesley got it. Inspector Scott Investigates : Deryck Guyler took the title role of the Scotland Yard detective in this enjoyable Light Programme series, created by John P. Wynn, which ran from 1957-63. A crime was committed; Scott and his sidekick, Det. Sgt. Bingham (Brian Hayes, brother of Patricia Hayes) interviewed two or three suspects; then , while music played, there was a short intermission for listeners to decide who had dunnit before the final denouement. Sports Report : was in two parts on the Light Programme. Saturdays 12.30-12.55 with Eamonn Andrews highlighting what was to come that day. Later at 5.30 or so he came back with the results. Variety Playhouse : began in 1953 and ran until 1963. Elsie and Doris Waters, Arthur Askey and Ronnie Barker all appeared in it. Often compered by comedian Vic Oliver, the theme tune was 'Prelude to the Stars' which Vic also composed. Breakfast with Braden : Bernard Braden and his wife, Barbara Kelly had come over to Britain from their native Vancouver, Canada in 1949 and were very soon to become major stars on both radio and television. Bernard's first shows were "Starlight Hour", "Johnny Washington" and most importantly "Breakfast with Braden" in 1950 whose verbal dexterity owed everything to Frank Muir and Denis Norden. It also featured singers Pearl Carr and Benny Lee, Ronald Fletcher and bandleader Nat Temple. In the autumn of 1950, it was turned into an evening programme, "Bedtime with Braden" which was when Barbara Kelly joined the cast. They gravitated to television later in the 1950s. Hi Gang! : Tremendously vigorous and popular wartime series which started on Sunday 26 May 1940 and starred Ben and Bebe Lyon and Vic Oliver. It was always introduced by Ben: "Hi Gang! ", Audience: "Hi Ben! ", Ben: "Welcome to your own Hi Gang show, coming to you from the heart of London, with Bebe Daniels, Vic Oliver and Ben Lyon - That's me folks!". Features included Auntie Bebe's advice column and Vic Oliver as the Radio Reporter, Peep Keyhole ('Peep-Peep!"). American film stars often surpise-guested. Who Knows? 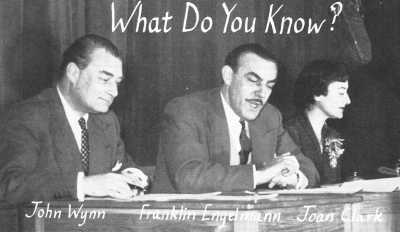 : Weekly question and answer programme on the Home Service, from 1956, with four scientists answering listener's questions on science and technology. The first chairman was Sam Pollock, his first panel was Robert Boyd, Harry Collier, Peter Sykes and G.P.Wells. Top of the Form signature tune Top of the Form : A very long running general knowledge quiz between immaculately behaved teams from rival secondary schools around the country. The programme debuted in May 1948, chaired by Wynford Vaughan Thomas. By 1949 there were two question-masters, Lionel Gamlin and Robert MacDermott. Each school had to field a team of four, of different ages - under thirteen, under fourteen, under sixteen and under eighteen. The programme went on to be variously presented over the years by Kenneth Horne, John Ellison and Robert MacDermott in the '50s, John Dunn in the '60s and Bob Holness in the '70s. Tim Gudgin was also a long term presenter of the programme for over 20 years of its run. Original production was by Joan Clark. The theme music was taken from "Marching Strings" by Marshall Ross popularised by Ray Martin and his Orchestra. The series also later ran on BBC TV with question masters Paddy Feeny and Geoffrey Wheeler and was produced by Alan Rees.